Most stacks and applications you create have more than one card, so how do you navigate between cards in your stack? Create a new stack from the File menu. 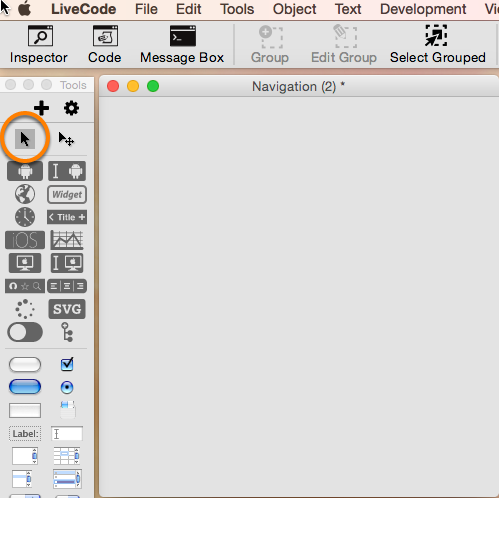 Open the Property Inspector by double clicking the stack, and name the stack 'Navigation' in the name field (1). 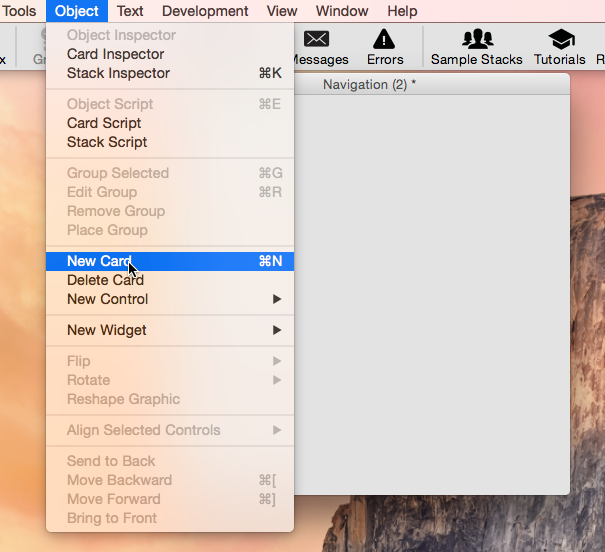 Add an additional card to the stack by selecting 'New Card' from the Object menu. Do this twice so you have a stack with 3 cards. 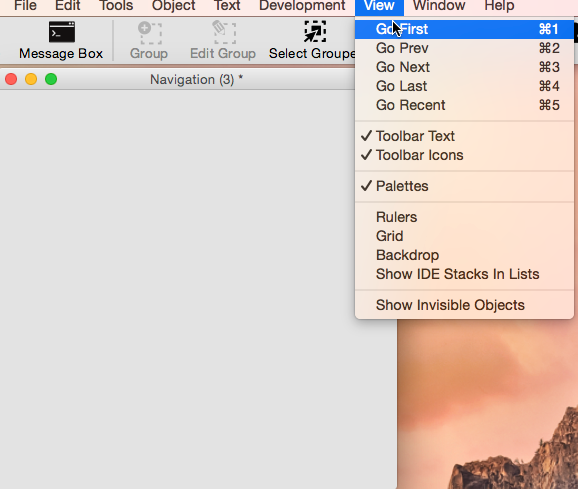 You will notice that the title bar of the stack now says 'Navigation (3)'. This is to tell you that you are on card 3 of the stack. While you are developing you can change between cards in your stack using the View menu. There are options to go to the first card, go the previous card, go to the last card etc. There are also keyboard shortcuts for these options. Try them, notice that the number shown in the title bar of the stack changes to show you which card you are on. So if you choose 'Go First' the number will change to 1 as you will be on the first card. You can also move between cards using the Project Browser. The Project Browser contains a list of all open stacks, the cards in each stack, and the controls on each card. You can access the Project Browser by choosing Project Browser from the Tools menu. 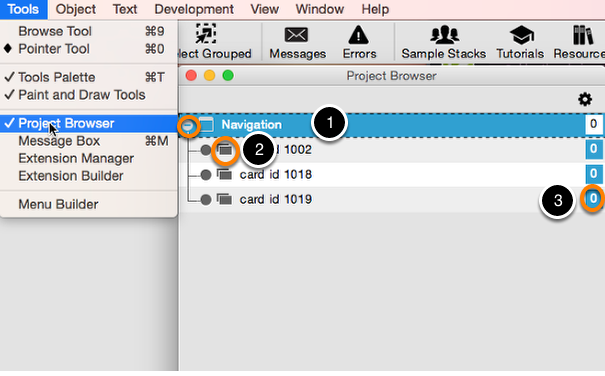 You can navigate to a card by double clicking it in the Project Browser (2). You can also edit the script of any object (3). When you build your application into a standalone, whether for desktop or mobile, your users won't be able to navigate around the stack as described above so you need to provide ways for them move between cards. You can do this by adding objects to your stack and adding LiveCode scripts to those objects that will change the current card. 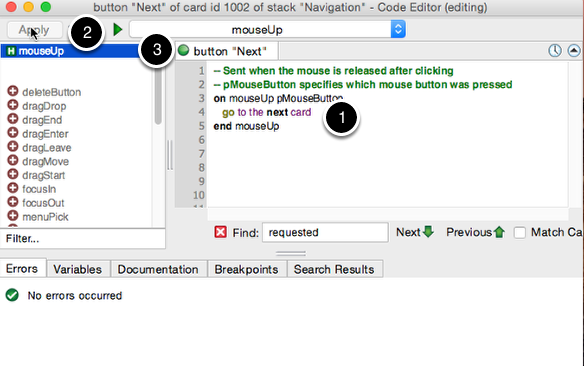 Go to the first card in your stack and add a button, name it 'Next'(1) using the Property Inspector. 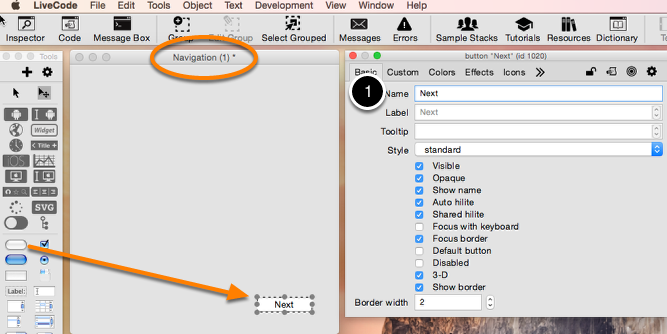 Open the Code Editor for the 'Next' button by selecting it and clicking 'Code' in the Menu Bar. You can type "on mouseUp" here and it will automatically add "end mouseUp", or you can select "mouseUp" from the list of possible handlers on the left. 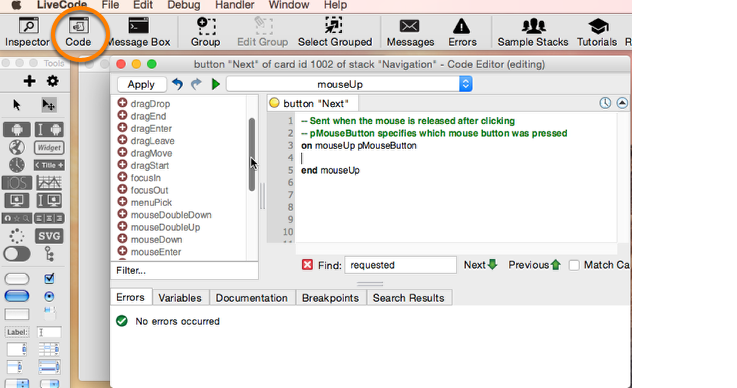 The mouseUp message is automatically sent by LiveCode when a button is clicked. While developing you need to be in 'Run' mode for this message to be sent. Compile the script by clicking Apply(2). The indicator is green(3) to show you that the script has compiled with no errors. To see if our script works switch to 'Run' mode and click the 'Next' button. You should see that we move to card 2. As well as going to the 'next' or 'previous' card you can go to a specific card by giving its name, number or id. go to card "main menu"
go to card id "1004"
I can fix this by making the button on the first page go to the next card, but I would like to avoid that. Is there a way to direct the program to look at the next card for the inputContents field? put "this is a test" into field "inputContent" of card "card 2"
Hi, I'm just starting to work with your software tutorials before I even download the programming environment because I'm not at home. I just have a quick question. When you add cards to the stack, I take it the cards are windows? I mean, why not just add controls to the stack itself if I only want to use one window in a program? Sorry, I come from a VB programming environment..
of course, there are many LiveCode applications that only use a stack with one card, but it really depends on the application you are implementing. LiveCode uses the concept of a stack of cards, similar to a stack of playing cards. Imagine that you could add a number of different buttons, fields, scrollers ... to each card. You can then move to another card with a totally different arrangement of buttons, fields, scrollers ... in the same application. This would be very useful if you were to create an application like an interactive story book for children with pictures and features they could interact with. It could also be used for a test framework in which you may want to validate certain features in an application you are writing. Each card could contain one test. There are many other applications that benefit from the stack of card concept. Once working with this concept, it allows you think the development of applications in a very different way. answer the cCustomPropertyVariableName of card "loginCard". Where "cCustomPropertyVariableName" is an arbitrary variable name you may use to store a value on a card, and "loginCard" is an arbitrary name of the card on which the variable is stored. I am having problems using the go to card command between stacks. I am able to make buttons that go to cards within the same stack, but as soon as I try to go to a card in a different substack the command does not work. I do not get any kind of an error, it just doesn't go. Any suggestions would be greatly appreciated from a newbie. Both are working by the way. LiveCode is a forgiving language and it allows you to achieve the same goal in different ways. This is one good example. As you point out, both versions work, and both version are legal. Use the form that suits you best. I got one question, can i give the cards name so we can revere to them by name instead by number? like screenOne, screenTwo instead of card1 and card2? sure. You can open the "Property Inspector" for the cards you want to rename and give them the names you want them to have. When you refer to them or navigate to them you can then use their names. For example: go to card "screenOne"
How would I move to a new card after a specific length of time without user input. "main menu" I suppose, is a default keyword...... or not? because I have no effects using this option. This just an example, if you had a card and you had set its "name" property to "main menu" you could use this line to navigate to it, "main menu" is not a LiveCode keyword, the name of a card. You can "go" to a card using its name, number id property, or by its positione e.g.first, last, next. I have a qwestion,if you have a field and a push button how can you make it where you type a specific thing in the field and then it will take you to a card? You can check the contents of the field in the button script and then go to a card if the text matches. Something like this should work. The View menu works well (go to the first card, go the previous card, go to the last card etc.) but keyboard shortcuts do not work. Have you ever encountered this problem ? We've done some testing here and can't recreate the issue, is it a particular shortcut that doesn't work or is it all of them? One thing that might affect the keyboard shortcuts is if you have custom settings in the System Preferences. If you can let us know we can look into it a bit more. Thanks for your response.The concerned shortcuts are the numeric ones (cmd-0 to cmd-9). The shortcuts with letters (cmd-m, cmd-t...) are OK. Trying with another keyboard give the same result. But the numeric shortcuts work in others applications like Vienna. I work at the same time with an older Mac (10.11.6 with LiveCode 6.5.0) and all is OK. Maybe my stacks created with various LC versions under LC 6 are now too old for LC 8.1.9 (successive conversions problem ?). Hi Olivier, could you test this with a new stack created in 8.1.9, just a simple stack with 3 cards or so? Then we will know if it is related to the version the stack was made with. Hi Elanor, I have the same problem with the shortcuts in a new stack in 8.1.9. Hi Olivier, unfortunately we still can't recreate this issue but we the Development Team are aware of it and will look into it further.